The season of harvest, fruits or otherwise. But mostly fruits. One of the things I greatly appreciate about Nagano here is a bounty of fresh local produce. It is particularly gratifying that certain kinds of fruits, such as apricots, nectarines, Italian plums, and rhubarb (technically not a fruit, but still) that would be hard to come by or pretty expensive when I was in Tokyo, are abundant over here. I have always been big on fruits ever since I was little, but I've come to bake a lot more with fresh fruits these last years being in here. From the beginning of summer through the mid fall, in particular, the green markets and grocery stores are positively flooded with fresh fruits, and so is my place; so these times of the year I would be seen busy baking with the heaps of fruits, as well as eating them. I think things may have gotten a little crazy two summers ago. And it was in that summer when I suddenly found myself in the mood for baking fruit tarts, among other things, for some reason. In fact, it was most likely because of the small tart pans I'd bought in Paris a little earlier. Now, tarts. I love eating them. I always have. But making them? Not so keen on it, I should say. I'm a pretty lazy baker, and all that making the dough, lining a pan (a lot of times, more than one) with it, and making a filling (again, sometimes more than one kind) would seem a little too fussy to me. And it actually does involve a little more than what I would get when making my usual suspects, such as scones and crumbles. But in spite of it all, I was suddenly ready to roll. What I found after I had done a few batches was the unexpected fact that making a tart suits my lifestyle rather well if I divide the work into two or more short stages; making the dough this evening and make the filling and bake the tart tomorrow, and so on. Also, once you got used to it all, the multi-stage tart-making process doesn't feel as daunting as it used to. And the more you make them, the better you get at it, right? That, I'm afraid to say, doesn't seem to be the case with my tart-making skills - or at least not where rolling the dough and lining a pan with it is concerned. But I quickly learned to be forgiving of all the uneven, cracked, and/or flimsy-edged tart shells I bake, and not to let my less-than-perfect pastry get me down too much. Even when they are not looking perfect, tarts loaded with fruits of the season are perfectly delicious. Besides, some types of tarts are totally allowed to look more or less misshapen. Now, what exactly is it that makes a tart, well, a tart? How is it different from a pie? You can google it away, but there seems to be no definitive, I mean DEFINITIVE, definition of a tart, or a line that sets a tart apart from things like a pie, or even a cake. Not all tarts have a crusty crust; some are like a thinly-baked cake, and others have a yeast-raised dough. It would seem that you can basically call anything a tart if it is thin-ish. And I'm perfectly alright with that. Speaking of the ingredients, I've been trying out different things, a bit of departure from the usuals, i.e. butter, wheat flour, sugar, and eggs. I've always interested in baking (and cooking) with 'alternative' ingredients, and as much as I adore classic tarts made using good butter and eggs, it's been both fun and liberating an experience to try and bake tarts with 'different' ingredients such as rice flour, buckwheat flour, oat flour, rapeseed oil, coconut oil, soy milk, nut milk, maple sugar, and coconut sugar, among other things. As a curious baker, I've always been game for baking with different ingredients and recipes, and am always drawn to healthier options. I've enjoyed baking from some macrobiotic books, and vegan and gluten free recipe books, among other things, and the latest addition to my collection of those lines of the baking books is a Japanese title called かんたんお菓子 ('Simple Treats') (Wave Publishers, 2012) written by Hiroko Shirasaki, a cooking instructor and author who runs organic (and egg- and dairy-free, mostly vegetarian) cooking school called Shirasaki Chakai. Tarts and tartlets featured in this book are built on a dough made using rapeseed oil (I use a good, cold-pressed kind) and a tiny bit of white sesame paste, filled with such interesting things as a 'custard' that consists of soy milk and rapeseed oil in place of milk and eggs, an almond cream made with silken tofu, ground almonds, and natural beet sugar. All of them can be prepared in a snap, and are quite open to substitutions as I've found out having tried different kinds of flours and milks. Not all of my attempts have been successful, but hugely fun nonetheless. You will find a lot of them in the following. So there are already so many recipes for tarts out there, and when you are playing around with the ingredients, the possibilities are endless. And THAT, my friends, is how I got myself deeply into the world of tart baking in the summer of 2012, and I couldn't really include all those tarts and tartlets I'd made in that humongous post about baking with summer fruits which without them was already waaaaaay too long. 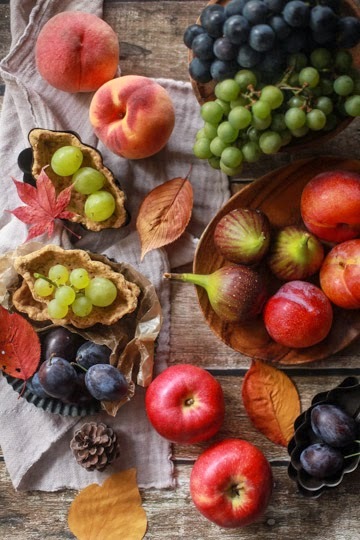 So I decided to do a separate post focusing on the tarts, and it's been a very long time coming but it's finally here, dedicated to tarts and tarlets starring fresh fruits of the season: autumn. I know it's kind of late in the season to do this; ideally, I would have liked to post this early in the fall, perhaps in the mid to late September. No, really ideally, I should have done this post two years ago. But it's too late for that at this point, and it was either doing this autumn fruit tart post NOW even if it is edging into winter, OR leaving it for another year. I've chosen to do it now and be done with it. So what follows a rundown on most of the fruit tarts I made in the falls of 2012, 13, and 14. As I mentioned earlier, a tart can take many forms; I took a liberty of using the term 'tart' in a very broad sense. This is early in September, when the mountains are still in deep green and the skies are heavy with summer clouds, though the mornings and evenings are rapidly getting cooler. I've been baking with such fruits as plums, peaches, and blueberries since the late summer, but when you start feeling a hint of fall in the air, I like to spice things up a little. Galettes two ways: a blueberry and blackcurrant galette with star anise, and a plum and peach galette with cardamom. I love making galettes; you can make them look as rough around the edges as you like, and they looks still gorgeous. The recipe is for the blueberry galette, and the plum version was a riff on it that I made. Loved the cream cheese based dough; soft and flaky. Aptly named autumn tarts with cinnamon pastry, these little guys were cinammon-spiked pastry shells filled with a mixture of plum chunks and berries, along with chopped white chocolate. The recipe is here. Last of the peaches and blueberries met early-season apples and they seemed to take to each other well nestled between a tart dough and a crumble topping in this fruit crumble tart. I didn't follow any particular recipe for this one, but I did use this for a coconut oil-based tart dough which has proved itself to be pretty handy. The crumble topping was made using olive oil and buckwheat flour, based more or less on the recipe I shared this past summer, with some leaves of lemon thyme instead of mint. To the fruit mixture I added a bit of spices, cinnamon and cardamom - just a little. Now looking at these photos, is it just me or does this tart look kind of more like a pie than a tart... (possibly because of the use of a pie pan)? No, just me. Definitely just me. NOW, these are tarts. Definitely tarts. Filled with custard and topped with a few kinds of fresh fruits I had around (here the peach, plum, fig, and grape), these fruit and custard tarts may be considered a very classic kind of tarts. The not so classic part is that the tart dough did not use butter and the 'custard' was egg- and butter-free, which made these tart almost vegan. Why almost? I know, I know, something that is almost vegan is not vegan at all, but these tarts could very well have been vegan, I mean completely vegan, had I not drizzled them with a bit of honey for a finishing touch. But I did, so that's that. The recipes for the tart dough and the soy custard are from Simple Treats by Hiroko Shirasaki, the aforementioned dairy-free baking book. Lovely with fresh fruits. I would now like to focus on some of my favorite autumn fruits in turn, starting with one(s) of my all-time favorites: peaches. Sweet and juicy white peaches, fragrant yellow peaches, and hybrids with nectarines, are all grown widely here in Nagano and are available from early August until mid to late September, sometime even pushing to October. It is always hard for me not to pick up a basket of them whenever I see them at the green market or grocery stores, but the urge becomes almost impossible to resist towards the end of the season, i.e. late September; you see, every time I see them, I'm like, "gosh, this could be the last ones I may see this season". I'm helpless. So I tend to have quite a lot of them lying around in the house in early fall, and although I like them eaten as is (i.e. uncooked) the best, I don't mind using some in baking, too. Besides, the late-season white peaches are typically firmer than their earlier counterparts, and they take very well to cooking. I made these whole(ish) peach tarts after seeing some of the store-bought kinds that appeared to be very popular throughout Japan a couple years ago. To be exact, though, my peaches were not whole but halved in these tarts; because they were very large and I didn't trust myself to be able to poach them intact. I'm pretty practical that way. Left whole or cut in half, the peaches get poached until soft before they sit atop the billowy mixture of pastry cream and whipped heavy cream that fills shortcrust pastry shells. I cooked my peach halves with their skin on, which both helped them keep in shape and tinted them in a prettiest shade of pink. Adorned with some chopped pistachios, these looked rather fetching, don't you think? Went down well with a chilled white wine too. Tart with red wine-poached peaches (tarte aux peches blanches et vin rouge), a recipe by the eminent Eric Kayser, from Les tartes d'Eric Kayser (Flammarion, 2006) (also available in English under the title of: Eric Kayser's Sweet and Savory Tarts). You have a fully-baked sweet shortcrust pastry with almonds, topped with slices of white peaches that have been poached in red wine and a bit of spices. I should think this kind of tarts are often filled with a pastry cream or almond cream and the likes, but not with this one, which spared me a lot of time and still made a delicious tart. To make this peach tart, you don't even need to roll out the dough and line a pan with it. A recipe by Amanda Hesser, it is available online here, but I first came across this no-rolling method in one of her books over a decade(!) ago, and I remember feeling enlightened by it. Speaking of, I think this was possibly the first tart dough recipe I came across that uses a vegetable oil (olive oil, to be exact) rather than butter (or shortening, as a butter substitute). All you need is to pat out the dough to cover the bottom of your pan, before placing sliced peaches over it and topping with a crumble-like mixture. Then into the oven it goes. Fruity and juicy, light as a cloud and ready in a flash. Sliced white peaches and figs are tossed in lemon thyme-infused honey and wrapped in a pastry. ...Okay, you do have to pull out a pan and cook the herb and honey, but that gets done very quick. And the lemon thyme-infused honey doubles as a syrup to flavor the fresh cream to serve with the finished tart, so it's well worth the (little) trouble. So, white peach and fig galette with lemon thyme. The original recipe uses only peaches, but I took the liberty of throwing in some fresh figs as well. Because, well, there were a plenty of them around. Unlike most other autumn fruits, locally grown figs do not seem to hit the green markets in a large quantity around here. It may be a little too cold for them to grow, I imagine. To be fair, some people do have fig trees in their backyards, and you may occasionally spot small punnets of the small specimens at the market, but neither is very common. That is why I buy most of my figs at the grocery stores, shipped from somewhere warmer in the south/southwest of the country. Like peaches, fresh figs are something I cannot help but pick up every time I see them towards the end of their season in late September and early October, which tends to result in my having quite a lot of them in the house. Also like peaches, figs are very perishable - so you really have to get busy to use them before they go bad. Earlier in the season, I like to enjoy them in their fresh, uncooked glory, like in this fig cornmeal tart. In fact, this one allows you to enjoy figs both fresh and cooked; the cornmeal-based tart shell is filled with a filling that's made of fresh figs cooked with brandy and spices, down to an almost jam-like consistency, and topped with the sliced fruit. The recipe is from The Last Course: The Desserts of Gramercy Tavern by Claudia Fleming (Random House, 2001), which is one of the books I keep turning to. The original recipe suggests you use kadota figs - a small, green kind. I used a bunch of small-ish figs of an unknown variety, those that you most often see on the trees in someone's backyard. These fig and blueberry tarts with mascarpone cream are a variation of one of my all-time favorite tart recipes (black and white tart) from How to Be a Domestic Goddess: Baking and the Art of Comfort Cooking by Nigella Lawson (US Ed., Hyperion, 2001). It's a really simple recipe that involves a crust made using digestive biscuits (or graham crackers), a mascarpone cream (much like the cream you make for tiramisu), and fresh fruits of your choice. I've made it over and over again using a bunch of different fruits, and this fig-blueberry version was just as delicious as any other. A little later in the fall, I made them again, using figs and sweetened chestnuts. Of all the sweetened chestnut products out there, my favorite would be shibukawa-ni, a type of candied chestnuts common in Japan, that are prepared by preserving the nut with their thin, inner skin ('shibukawa') on. The ones I used here were not what is known as shibukawa-ni, but a little lighter (less sweet) version - I don't really know if there is a common term for these! Anyhow, fig and chestnut tarts with mascarpone cream. The use of chestnuts instantly gives a tart a touch of autumnal flavor. And here is something else with fresh figs with another autumnal flavor. Pumpkins! These fresh fig and pumpkin cream tarts, the original recipe for which you can find here, consisted of a vegan wholewheat-hazelnut crust (which I loved! ), a mixture of pumpkin butter and whipped cream (I used a bit of mascarpone cheese and heavy cream), and fresh figs. Loved the combination of the fig and pumpkin, and fig. It's hard to tell what this is from this picture, I understand, but think of it like a tarte tatin - the fruit gets caramelized in the pan, covered with a pastry dough, and baked in the oven. Except, the fruit here is figs rather than apples, and the pastry is not a puff pastry but a very crumbly kind. Thus called a crumbly, upside-down tart of figs, a lovely recipe from Nigel Slater's Tender: Volume II, A cook's guide to the fruit garden (Fourth Estate, 2010); called Ripe in its US edition, this book is an excellent collection of fruit recipes (and gardening info) that I always turn to as a new season comes around for a fruit of all sorts. Sir Nigel suggests you serve this tart hot with creme fraiche or vanilla or cinammon ice cream, and that was what I did here - with homemade cinnamon ice cream! Divine. Now Tender II was definitely one of the books I used the most for making all these tarts, and another one is Baking: From My Home to Yours (Rux Martin/Houghton Mifflin Harcourt, 2006), by a grand dame of baking that is Dorie Greenspan. I can't say I have cooked most of the recipes from this massive volume, but I have quite a few, and all of them have been wonderful. And this honey-almond fig tart is no exception. It is one of my very favorites among all the fig tarts - in fact, any tarts I've ever made. It is, in essence, a very simple tart, really. But it's really delicious. First, you make Dorie's Sweet Tart Dough, which in itself has become my go-to pate sablee recipe. If you don't have the book, which I really think you should, you can find the dough recipe online, here. Then you make a honey-kissed almond cream, and fill the partially baked pastry shell with it along with halves/slices of fresh figs. The result is an amazingly delicious tart that has won me raves from my family and family friends. In one fall a couple years back, I think I baked this about four times in a month, mostly to give away as a gift. As a variation, Dorie suggests adding some finely chopped fresh rosemary to the almond cream, and being a card-carrying rosemary addict, I was quick to follow this piece of advice, to a fantastic result. Other suggestions included a substitution of other fruits for figs, such as red ruby grapefruit (for "France-meets-Florida Honey Almond Tart"! ), which I have also tried and enjoyed. Not really autumnal, but lovely. Figs can play solo perfectly, but they work nicely in an ensemble as well. Like in these fig and raspberry frangipane tarts, for instance. Partially baked tart shells are first slathered with a raspberry jam, then filled with frangipane (almond cream), and topped with sliced figs and raspberries, and a bit of slivered almonds too boot. You can see the recipe here. I used a very light jam, but the finished tarts were really quite sweet. Tasty, but sweet. Fig and potato tart. The potato, as in, white potato. You know, the kind you normally boil and roast and mash and all. The recipe is from からだにやさしいお菓子とパン (Good-for-your-body Pastries and Breads) by Yumiko Kano (Seibido Shuppan, 2008); the book is focused on naturally-sweetened, egg- and dairy-free baking recipes that feature vegetables as a central or supportive player. This particular tart is built mostly on a potato dough, which is a sort of mashed potatoes mixed with a bit of flour and ground almonds, topped with sliced figs and drizzled with maple syrup. I got this book quite a while ago and was always curious about this recipe, and this year I finally made it. My verdict? In two words: too savory. In nine words: a little too savory to pass as a dessert. I'm not saying it was not tasty, because it was - in a rustic sort of way. As long as you don't except it to be a sweet treat, it makes a totally fine snack. I was sort of suspicious as I prepared the tart, and decided to make a sweeter version as well, replacing the potatoes and figs with sweet potatoes and apples, respectively. These apple and sweet potato tarts turned out to be excellent. Fig and Italian plum tart. The recipe from Simple Treats by Hiroko Shirasaki, this is another (mostly) vegan, egg- and dairy-free tart that consists of an oil-based tart dough and tofu-based almond cream. Also called frangipane, an almond cream is usually made using ground almonds, sugar, eggs, and butter. A bit like the soy-based 'custard' from the same book that I mentioned earlier, this recipe replaces the butter and eggs with tofu and rapeseed oil. Some of the people who had this tart said they didn't taste the tofu, but I did - but I didn't mind it. It may indeed put some people off, I don't know. I found an addition of some spices to the almond cream (cinnamon and cardamom here) helpful. I also found that partially baking the shell before filling it with the cream helps avoid the soggy bottom, although the books doesn't tell you to do so. Perhaps it depends on the oven you use. The tart, by the way, was pretty good. ...well, this is not as much a combination of figs and Italian plums as a half-and-half of the two. I just wanted to make two kinds in one, rather than making a whole big pan of the same thing. And what was the 'thing', exactly? This, though hard to tell from this picture, may be called a yeasted crumble tart with figs and Italian plums. Technically, the 'crust' is a yeast-leavened, brioche-like dough, so some might challenge the legitimacy of the use of the term 'tart'. Me? I'm totally, completely, perfectly fine with it. And in fact, this isn't just me trying to justify the use of the word, but it is common for this type of pastry to be referred to as a 'tart', especially when it is made with Italian plums; other fruits, such as apples and figs, may be used as well. Here served with vanilla ice cream. Mmm! Tarts made using fresh Italian plums and a yeasted dough such as this seem to be originated in Germany, and you can find a lot of recipes out there. Here I used one by Nigella Lawson, again in How to Be a Domestic Goddess （German plum tart). I made it back in 2012, when I was still a very timid bread baker. Soft, sweet doughs like this one here were one of the few I could make with some confidence, so I used to make them quite often. And two years on, I am still making them every now and then. This one, I made earlier this season using Italian plums, figs, and raspberries. The dough gets smeared with some raspberry jam, topped with sliced fruits, then a generous amount of muesli (homemade; still making it every so often) before it goes into the oven. The recipe is called berry breakfast tart; yes, tart! See? Anyhow, Italian plums (aka prune plums) were here. They may actually be spotted at green markets and supermarkets as early as mid August, but Italian plums come to the height of their season in mid September around here. Nagano, again, is a huge Italian plum producer of the country, and we see them in heaps at our local green markets. The yeasted plum tarts I mentioned just now are something I like to make and eat, and I have tried a lot of different recipes. For this one pictured above, the recipe hails from Germany, called pflaumenkuchen (plum cake), in My Berlin Kitchen: A Love Story (with Recipes) by Luisa Weiss (Viking Adult, 2012). Very straightforward and very tasty. So was this recipe (Hello Nicky!). Adorned with chopped almonds, this one was created by Dorie Greenspan, which again is from Baking (brioche plum tart). Soft and juicy and crunchy, all in one bite! True to its name puffed double plum tart, this checkerboard of a tart features Italian plums in two forms: fresh and dried (prunes; stewed in red wine with spices), on a sheet of puff pastry that indeed gets puffed when baked. You can use a store-bought puff pastry (which I did), so it is both gorgeous and quick to make. By now you may or may not be wondering, yeasted doughs and puff pastry are all good and everything, but do I ever make a bona fide, I mean classic, type of tart with Italian plums at all? Well, I have! Italian plum tart with cinnamon (tarte aux quetsches a la cannelle), recipe from Les tartes d'Eric Kayser. A buttery crust, rich almond cream spiced up with cinnamon, and juicy Italian plums. This is as classic as a tart can get. Simple and beautiful too. Actually, it looked a lot more beautiful in the picture in the book, but I seem to have had trouble with stuffing, I mean arranging, the plum quarters in the tart shell. Oh well. So while this would never find a place in the showcase of any respected and respectable patisserie in Paris, it was fine around here deep in the middle of a Japanese countryside. Phew! Double grape tart (tarte aux 2 raisins). A tart shell filled with a mixture of pastry cream (custard) and whipped heavy cream, topped with halves of fresh grapes in two colors. Very simple to make, yet creates a stunning effect. Nagano, again, produces a lot of grapes in a number of varieties, mostly around late September to mid October. I usually eat fresh grapes as is, as they are meant to be - but my recent obsession with tart making demanded I make them into some tart or other. That said, the double-grape tart above may have been the only one that I've made using fresh grapes alone; in all other instances, I seem to have used them in combination with some other fruits. Such as these grape-fig tartlets with sweetened chestnut cream, for instance. I don't think I followed any particular recipe for these; I can't remember very well, but I do remember they tasted good. Note to self: keep a note if you made something and liked it! Another fig-grape combo, but with a savory touch here. Starting with this recipe, I swapped blue cheese for goat cheese (which you just don't find down here), made in a smaller size, and added a handful of chopped walnuts. Baked on a light puff pastry, these savory fig and grape tarts were meant to be enjoyed with a glass of white. This combined grapes with the Asian (nashi) pear, on a sweet yeasted dough. Basically like those Italian plum tarts we saw about a few scrolls backward, but here I made an egg- and dairy-free and wholewheat 'brioche' dough, based loosely on the recipe here - to a less-than-satisfactory result. The dough didn't rise much and turned dry, which was a real shame as the flavor of the tart itself was really lovely, with an addition of ginger and lemon thyme. So all I can say is that the intention was good with this yeasted Asian pear and grape tart with lemon thyme and ginger. By the way, I suppose this tart would normally be made using pears - you know, one of those 'pear-shaped' kinds. Nashi pears are, or were until very recently, a fruit that few would approve of eaten cooked here in Japan. I know a lot of folks would find the idea of baking with them shocking, or outrageous even. But I broke this particular taboo years ago (I made muffins like these (in Japanese)), and I have since seen quite a few recipes that call for Asian pears baked, so I think things are changing. That is not to change the fact that I like them eaten fresh the best, though. While nashi pears generally make their appearances at the store in late August, pear-shaped pears arrive a little later; ours are at their peak in October around here. When I was a kid, the only pear-shaped pears - called yonashi, or 'Western pear', literally - I knew were the canned kind, and I remember being thrilled to see the fresh ones for the first time. They eventually became fairly common (and much less expensive), and these days here in Nagano, I see them in heaps at the green market come autumn. Things change with the time indeed. I like Asian pears eaten fresh, but with yonashi, I like them in any way - fresh, baked, poached, or even dried. And they make truly fabulous tarts, too. This is pear and pecan tart, from Tender: Volume II by Nigel Slater. As Mr. Slater himself muses that he is "honestly not sure if this is a tart or a cake", this is on a thin line between the two - no pastry shell involved, and the texture is fairly cake-y. With all that and everything, when Sir Nigel calls it a tart, tart it is. You just bake thing thin-ish. ...Which I somehow failed to do here as you can see in these pictures, owing largely to the size of the pan I used. This was more like a cake if I am completely honest with you, but it was too delicious not to include in this post, so let's just say next time I will make sure it looks more like a tart. And yes, it's totally worth a 'next time'. Pear and fig tart with pistachio frangipane. You often see a tart that consists of pears in syrup and frangipane (almond cream) in a pastry shell, and it's beautiful. Swap pistachios for the almonds, and it's gorgeous. First I found a recipe (again) in Eric Kayser's Les tartes d'Eric Kayser. Then I was inspired (again) by Simple Treats by Hiroko Shirasaki to create an egg- and dairy-free version, by making the tofu frangipane with ground pistachios in place of almonds. In addition, I made the pastry dough with rice flour and oat flour, thus turning the tart gluten-free as well. I poached the pears in a mixture of white grape juice and white wine, sweetened with honey. The (homemade) apricot jam I used to glaze the finished tart was also honey-sweetened. Other than that, the tart could easily have been vegan; not that I minded too much either way. If anything, I would rather work harder to make a better gluten-free tart dough. Will see. I loved the pairing of pears with fresh figs (yes, I was still buying them, until they disappeared from the store shelves for the season...), but a smaller version I made with raspberries (= pear and raspberry tart with pistachio frangipane) was lovely as well. Pears and raspberries go very well together, so this was a no-brainer, really. And did someone just say raspberries? Okay, I did. The raspberry is my most favorite berry, and may very well be my most favorite fruit - certainly one of them. A sight of fresh raspberries never fails to fill me with joy, and as much as I adore their vibrant sweet-tart flavor that is the epitome of early summer, I am also enamored by the autumn-harvest kind for their rich sweetness, that comes around for a very short period of time in late October or so. You can find them at the green market if you are lucky, or you could go and pick some, as I did at the end of October two years ago. That time I went a little nuts and came home with about 7 lb (3 kg) of them. Some of which went on to star in some gorgeous tarts. Raspberry and mascarpone tart. Need I say more? ...Okay, perhaps I do need to say that the recipe was from Nigella Lawson's How to Be a Domestic Goddess (black and white tart); the same one as those I made with figs, somewhere earlier in this post. This recipe really is amazing with all sort of fruits, but don't you think raspberries make a stunner of a tart? And this was a kind of finishing you could do only when you have the fruit in a large amount. I was so chuffed! Raspberry-Earl Grey tart. A fully baked pastry shell was filled with a Bavarian cream-like filling flavored with Earl Grey tea, then adorned with fresh raspberries. You can find the recipe here. Look at these rows of raspberries. A mere thought of it makes me smile, although I admit it is about a hundred times better to actually have it. But still. Sadly, this summer I didn't have a chance to go raspberry picking, nor did I see any at my local green markets. So imagine my delight when I spot a solitary punnet of them at the market at the very end of October (and again in early November). I think I literally whooped and jumped in joy. I ate a few, then turned the rest into tarts. Raspberry tartlets with chocolate pastry cream. The (vegan) pastry dough and cream were made based on the recipes from, once (or fifth-time?) again from Simple Treats by Hiroko Shirasaki. Here I made the dough using half wheat flour and half oat flour. These tiny tartlets with tiny raspberries looked almost too pretty to eat, but we did eat them anyway, and did so in a blink too. ...Well, I actually made these soft chocolate and raspberry tarts before the other one, but my point is, raspberries and chocolate are meant for each other. The recipe is from the every reliable Baking by Dorie Greenspan. Speaking of reliable, you can make these with frozen raspberries, as I did- so you don't have to wait until the fresh berries come around next summer to make these. Hooray! And speaking of berries, blackherries are another kind that you can find fresh past summer and well into late fall, or early winter, even. Around here we are not so lucky, unfortunately, but that doesn't keep me from baking with blackberries (from the freezer), when it's cold out. There is something wintery and comforting about them. I made this blackberry macaroon tart when it was still warm-ish, but I think this can be enjoyed any time of the year. It is put together very quickly, too; both the crust and topping are a simple affair, and you don't need to roll out the dough, either. Like its namesake treat, macaroons, the tart is loaded with coconut and quite sweet, which makes blackberries a perfect fruit to use in. We enjoyed ours in small slices, with strong coffee. The recipe is from Super Natural Every Day: Well-Loved Recipes from My Natural Foods Kitchen by Heidi Swanson (Ten Speed Press, 2011). You can find almost the same recipe here on Heidi's blog, where she made it with cherries. That looks great too. This one here ended up looking a bit too dark all over, due to my use of candied chestnuts, skin side up, but this blackberry and chestnut tart tasted really rather wonderful. It was in essence a common combination of a tart shell with almond cream and fruits, but it was, again, (mostly) vegan version using the dough and tofu almond cream from Simple Treats by Hiroko Shirasaki. I say mostly vegan because I dusted the tart with a regular confectioner's sugar, which may or may not be vegan. The blackberry and chestnut seemed to me a good match, and they indeed were. Would also be nice with chocolate, I imagine. But if you want to pair blackberries with another fruit, I think apples would be the best and most solid bet. I didn't need any particular recipe for these little apple blackberry galettes, but just put things together - a good, flaky pastry dough and sliced apples and blackberries tossed in just a bit of sugar, that's pretty much all you need. That said, some ground almonds sprinkled over rolled pieces of pastry, and the finishing touch with chopped butter and sand sugar, contributed to the great texture and flavor of the finished product, I suppose. Golden leaves and golden tarts. This is autumn. Kogyoku, or Jonathan, is the apple variety of choice for baking here in Japan (I talked about it here a few years ago). These came from a family friend's orchards, and I don't know what I like better about kogyoku - the perfectly tart-sweet flavor or the incredible smell that fills the room. As I have mentioned over and over again, you get a whole lot of fruits grown here in Nagano, but apples are special; Nagano has long produced some of the best apples in the country, and this ancient fruit holds a very special place in people's hearts. Some of the early-harvest varieties start popping up at the green markets as early as mid August, but you need to wait until October before they come into their own; the markets are literally dominated by apples of all varieties. Kogyoku, too, are their height in early to mid October, and that's when I typically start baking with apples. It's partly because kogyoku is the best apple to bake with and totally worth waiting for, but it's also because I tend to have my hands full before then, with a plenty of other fruits (peaches, figs, plums...) to bake with. And early in the season, I usually opt for something light. You make thin crusts using lemon and olive oil, sprinkle them over with a ginger-spiked walnut crumble, then top with wafer-thin slices of apples. Then into the oven they go. Et voila - apple tarts with ginger, lemon, and walnuts. Seriously, isn't this the most gorgeous tart? When I saw the recipe in La Tartine Gourmande: Recipes for an Inspired Life by Béatrice Peltre (Roost Books, 2012), I knew I just had to make them. And I did, to a great success. And I freely admit that I also attempted to emulate Bea's styling for the picture, too - to not so great a success, perhaps. Anyhow, the original recipe, which you can also find here, makes smaller tarts (thus tartlets); but for a variety of reasons, mine ended up being a lot bigger. But because they were so thin and light, you can eat a lot of them, no problem. And incidentally, being one of Bea's recipes means these were gluten-free, which is an added bonus. ...and one that made me want to copy the styling, too. This apple tart, created by the talented Aran Goyoaga, is called The Easiest Apple Tart You Will Ever Make - you may argue if it is THE easiest EVER, but it's pretty darn easy, that's for sure - and still manages to look pretty, and definitely yummy, too. You can find the recipe here, and see it for yourself! The original recipe uses pink-fleshed apples, which indeed makes a really pretty tart; but we don't find those, so I just used a red-skinned kind (kogyoku) and left the skin on for some of the apples. This is another one of those no-need-to-roll-the-dough tart, which really is a savior for lazy and clumsy bakers like myself. And I happen to have made another one like this. This is szarlotka - no, I don't know how to pronounce it, either, but I do know it's delicious. As I take it, it is usually translated as Polish apple tart (or cake), and I think mine was very authentic recipe, coming from a polish book titled O Jabłkach by Eliza Mórawska (USTA Magazine, 2014). The title means "About Apples", which it indeed is, with about 40 recipes starring apples, both sweet and savory, all beautifully photographed. The author, Liska, is the blogger behind White Plate, which many say is the top Polish food blog, and I'm inclined to believe it. I am very lucky to know her, who was a huge source of information about the food scenes in Warsaw when I visited there a few years ago, both through her blog and in person. It was lovely to meet her there, and this fall, I was thrilled to receive a copy of this new book of hers about apples (thanks!! ), and after I got it in mid September, I busied myself with putting sticky notes on a bunch of recipes and did some translation as I waited for kogyoku apples to arrive in October. And when they did, this was the first recipe I tried from the book. A crumbly and cinnamon-y pastry (made using a dash of vodka!) provides both the crust and topping, between which lies slices of stewed apples. I may not be able to say the name of the tart correctly, but the thing itself tasted homey, and I felt right at home with it. Liska has a similar recipe (or the same, perhaps) on her blog; even if you don't understand Polish, you can still get a very good idea of it if you Google translate it like I did. The apple season may span a few months, but kogyoku apples are around only for a few short weeks, and they don't keep for very long as some others do. So I try and do my best to showcase their stunning ruby color while I can. Here apples were sliced very thin, and I mean very thin - you-can-see-through-it thin. Then they were carefully put together, overlapping one another, to look like a rose, which was then planted in a 'pot' of pastry dough filled with milk jam (be it confiture de lait or dulce de leche), before they got baked. Again, I didn't follow any particular recipe, but I had seen apple tarts made to look like roses on the Internet or elsewhere, and finally tried my hand at making some. This kind of decoration is totally NOT my metier (my family did a double take as they saw me at it...), but I did my best and I think they (or at least some of them) could be said to look like roses. So can I please call these apple rose tartlets? Thanks. I was reasonably satisfied with how they looked, but not so much with how they tasted; as I said, I didn't follow any recipe and sort of threw things together. This strategy sometimes works, but sometimes doesn't. Oh well. ...oh wait, this isn't a rose, is it? Except perhaps for the middle bit?? I'm hopeless with flower and plant names, but I guess not. But a flower-shaped, nonetheless. So apple flower tart, maybe? This pretty shade of pink that contributed to the flower-like look came from the apple peels with which I cooked my apple slices. The recipe was yet again from Simple Treats by Hiroko Shirasaki, with the tart dough made using rice and quinoa flours and the 'custard' with walnut milk (homemade!) in place of soy milk, hence vegan and gluten-free apple tart with walnut custard. There was much room for improvement both with the pastry dough (too fragile) and the decoration (a bit floppy), but I could live with that. This one here could do with even more fineness, but believe me, tasted lovely all the same. There seem to be a wide variety of apple tarts that are named Normandy apple tart, after the biggest apple-growing region in France obviously, but this version consists of an apple sauce and sliced apples. The recipe is from Dorie Greenspan's Baking, so you can count on it being a reliable one. It was. There was an unmistakable late-fall feel about this homey, double-apple tart, making it a perfect thing to have when it gets chilly out. So it does, as I spend the second half of October busy baking with apples. Here in the mountains, the leaves turn orange towards the end of October, so the trees look autumnal, but the air starts feeling more like winter. Autumn fruit tart, using what I happened to have around in the house one mid October day this fall. Yellow peaches, figs, pears, Italian plums, grapes, and strawberries(!) - everything but the figs came from the local green markets. I made the pastry dough with wheat flour and buckwheat flour, and the vegan pastry cream using soy milk in which I'd steeped bay leaves and black peppercorns. As you can clearly see, the style of this tart made it NOT an ideal thing to serve in 'equal' slices, but I'd seen this beautiful tart months before and just had to try making something along the line. The recipe for the tart dough and custard were from Simple Treats by Hiroko Shirasaki. I think about a half of the tarts I made this fall were based out of this book, and now I come to think of it, this is pretty much the same thing as the fruit and custard tarts I mentioned three years ago, I mean near the beginning of this post, which in all fairness feels like three years ago. Is anybody still here with me?? I hope you are, because this one here is a really nice one, too. Again an assortment of autumn fruits I happened to have around, but here they got baked in the pastry into a glorious buttery goodness that is called Fall-market gallete. The recipe was again by Dorie Greenspan, but from her new book Baking Chez Moi: Recipes from My Paris Home to Your Home Anywhere (Rux Martin/Houghton Mifflin Harcourt, 2014). It came out late October and this was one of the first things I tried. Apart from the tart itself which was fantastic, the galette dough recipe is fabulous; very easy to work with, and makes a beautifully flaky tart. The tart was in itself quite straightforward, but the mixture of season's fruits (I used figs, grapes, Italian plums, apples, and strawberries), combined with some walnuts, and good butter and some sugar really does wonders. There was no spice involved, the tart was truly aromatic and had autumn written all over it. And that's it - tarts with fruits of autumn, about 50(!!) kinds of them. Like I said, I started working on this post in the autumn of 2012, and over the two years there have been a few tarts that I made and took pictures of, but can't for heaven's sake remember what they were now I look at them. And I thought blogs are here so you can make a note about what you've made! There are a few reasons why it has taken me this long to put together this blog post, and the biggest one would be the usual; I didn't have enough time. Uh-huh. Right. But another is, I keep finding new good-looking tart recipes, and can't help but make them and try to include them in this post that I have been working on forever. The more I try to cram into it, the further the end of it seems to get. But enough with my excuses for my poor blogging habit. What I wanted to say is, the autumn here gives me an abundance of the most wonderful fresh fruits, largely locally-grown, and I find enormous pleasure in baking with them as they come one after another. And as the autumn advances towards the end, the pleasure is mixed with a tinge of desperation - you know, you have to hurry before the stores have nothing but apples and satsumas. After autumn, winter feels rather empty where a supply of fresh fruits are concerned, but I have made some fruits tarts last two winters, and I will this year, too. So expect to see a winter fruit tart post up here, sometime this winter - hopefully before the end of it. And I can't help but feel the winter is very nearly here, as I see the trees turning colors and getting barer, literally by day. Before I shut up, I am leaving you with one last tart (really!) that I made at the end of November last year. This one combines a spiced pumpkin filling with thinly sliced apples and some cranberries (the original recipe uses dried, but I used frozen). Late autumn all around. To be honest, over here by the end of November, the colors mountains get completely muted, and it can even snow - it's definitely more winter than autumn. But as the recipe calls it autumn apple and pumpkin gallete, I decided to include this in here. You'll find a lot of apple tarts in the winter entry, too - consider yourself warned! Your posts are always amazingly beautiful and so full of great ideas! Thanks for taking the time to put this post together and I look forward to trying some of these tarts. I had a quick question--is there a recipe for the fig, walnut, and goat cheese one? Love the whole of photos. So beautiful and poetic as always. hi Kat Tang, thanks so much! there is a link to the original recipe for the fig and grape tart; i just tweaked it a little as i briefly explained in my post. It was such a pleasure to see you mention the Polish cookbook and White Plate! Yes, the person who runs it is great and I can confirm the blog is a big thing in Poland. Absolutely gorgeous photos, as always, what an autumn bounty. I have been reading your blog for a long time, but have never commented! I really enjoy your blog "voice," to read about your various experiments, and the photos are truly aspirational. Thanks for sharing all of it. There is so much inspiration here, thank you for going through a lot of effort to write this post! I am not a very good baker and with a baby in the house, I don't find much time to even try baking anymore. For now, I will just enjoy these photos and your writing instead! I really do envy you for the area you live in. It looks wonderful with all the varieties of fresh fruit and the cool(ish!) summer. I live in suburban Kansai and I have not seen a punnet of raspberries in any shop here in seven years... sigh. I love them so much and they were my favourite fruit as a child in the UK. I wish your Nagano raspberry farmers would ship to shops over here to west Japan! I would probably come home laden with 3kg just like you...! So many tart recipes use ground almonds/almond poudre (another thing I love and miss) - don't you find it to be terribly expensive in Japan? I have never found a good source for it. Hi Eleanor - thanks and sorry about my very late reply! if you read this and haven't tried them yet, you can look for baking supplies shop such as Cuoca and Tomizawa Shoten (both have an online version) for decently priced ground almonds. as for fresh raspberries, i do know how you feel and i know we're extremely lucky here. some of them do ship if you place an order, but they are by no means cheap. now i am missing fresh raspberries too!